This is the ultimate 2Ghz wireless outdoor CPE with integrated 14dBi dual polarity antenna. Great Performance: 150+ Mbps real outdoor throughput and up to 15km+ range. Typical range is 2-4 miles from a LOS tower running airMAX sector antenna's and Rocket M2's. Next-Gen Antenna Design: 11dBi dual-polarity gain with optimized cross-polarity isolation in a compact form-factor. Dual Ethernet Connectivity: A secondary Ethernet port with software enabled POE output for seamless IP Video integration. Intelligent POE: Remote hardware reset circuitry of NanoStation M allows for device to be reset remotely from power supply location. 802.3af 48V Compliant - Easily becomes 802.3af 48V compliant through use of Ubiquiti Instant 802.3af adapter. Easy Installation - Easily mountable to a pole/mast with mounting straps provided. In addition, the NanoStation M2 can be mounted and adjusted in any direction in a 90 degree angle through the use the NanoBracket. 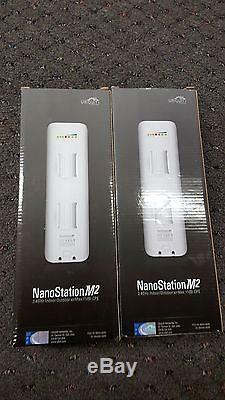 One (1) NanoStation 2.4GHz. One (1) Power Injector: 110-240VAC 24VDC 0.5A US-style plug. Featuring a compact indoor/outdoor design and an interface, it is so intuitive even the most technically challenged can instantly become experts. But don't be fooled--it is as powerful as it is simple. NanoStation packs some phenomenal performance with a revolutionary design combining a high-gain antenna system, advanced radio architecture and highly researched and developed firmware technology allowing throughput, stability and capacity performance rivaling even the highest-end Wi-Max networks. The NanoStation M2 makes a perfect CPE device when pared with the Ubiquiti Rocket M2 and airMAX Sector or a Dish Antenna. This device can also be used for short LOS PtP links by placing one unit in Access Point WDS Mode and the other unit into Station WDS. Processor Specs: Atheros MIPS 24KC, 400MHz. Frequency: 2.4Ghz Channels 1-11. Wireless: 2Ghz Atheros, 27dBm Adjustable down to 8dBm. Memory Information: 32MB SDRAM, 8MB Flash. Networking Interface: 2 X 10/100 BASE-TX Cat. 5, RJ-45 Ethernet Interface, PoE Passthrough. Operating Temperature: -30C to +80C. Power supply included: Power Injector 110-240VAC 24VDC. Size: 29.4 cm x 8 cm x 3cm, Weight. Approvals: FCC Part 15.247, IC RS210, CE. The item "Ubiquiti AirMax NanoStation M2 X2" is in sale since Monday, January 18, 2016. This item is in the category "Computers/Tablets & Networking\Home Networking & Connectivity\Wireless Access Points". The seller is "timatang101" and is located in Simi Valley, California. This item can be shipped to United States, to Canada, to United Kingdom, DK, RO, SK, BG, CZ, FI, HU, LV, LT, MT, EE, to Australia, GR, PT, CY, SI, to Japan, to China, SE, KR, ID, to Taiwan, to Belgium, to France, to Hong Kong, to Ireland, to Netherlands, PL, to Spain, to Italy, to Germany, to Austria, RU, IL, to New Zealand, SG, to Switzerland, NO, HR.